The rapid growth of Socialism in our own country is a fact which has been thrust upon the observation of even the most skeptical. The many explanations which are offered to diminish its significance are largely unsatisfactory. Men who at first enter the movement with but vague motives to impel them are likely soon to be changed into enthusiastic promoters. "Never be satisfied with making a convert," is the Socialist principle; "you must make an apostle." There is one means which insures these effects and which will continue to produce them in an ever greater extent, and that is the prodigious and universal diffusion of Socialist literature. In spite of all the exhortations of the Holy Father, we have done comparatively little for the cause of the Catholic press; but Socialists have fully seized their opportunity. The propaganda of Socialist literature is being promoted at the cost of every sacrifice. Yet not one of all these sheets but carries in it the seeds of infection and of death. In one meeting alone the motion was passed to publish ninety million copies of propaganda matter. We may have warned our people against the danger of the poison so frequently offered them; but who can say that we have succeeded in stimulating a similar diffusion of that Catholic literature which can furnish the antidote. Here, therefore, is the main ground why we say that the growth of Socialism presents no illusion, and that it is a reality which we shall be called upon to reckon with even far more seriously in the future. To every unprejudiced student who still is imbued with the truth of the supernatural and makes of it the guiding light of his thinking and his acting, Socialism is the most complete expression of all that was embodied by St. John in that one word, "the world” as opposed to the spirit of Christ. With "the world” whether found in Capitalist oppression or in Socialist class-hatred and Materialism, the Christian can have no common cause. From it he can merely look for deadliest opposition, even though it should come to him under the guise of well-feigned friendship. The weapons which first and foremost we must therefore have in readiness are those of the spirit, and the mightiest among these is the Holy Eucharist. "How" we might once have asked, "are we to surmount the indifference, the irreverence, the doubt and denial which the agnostic surroundings of our Catholic population are so likely to beget?" This is no longer a problem for us. The Holy Spirit Himself has clearly taught us the answer. It is most evidently contained in those great, providential decrees on Frequent and Early Communion. Should we fail to avail ourselves of these even to the utmost, the negligence indeed were folly; but disobedience by setting them aside were fatal unto death. Our greatest hope is in the Sacred Heart which beats within the Eucharist. The arm of God is not shortened and the wonders of the Eucharist in the Church of the early centuries shall repeat themselves to-day. The same power that conquered the paganism of old can triumph over the godlessness of the modern world. 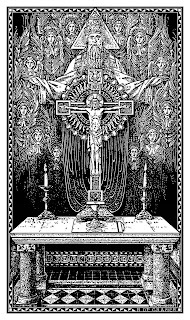 What was the source of strength to the early Christian in days like our own if not the Holy Eucharist, received by the faithful at every Mass and borne in napkins of immaculate white to the prison cell? Thus was the flame of living fire kindled in the breast of the believer, and spreading outward and onward under the breath of the Holy Spirit, the Pentecostal storm, it at last enwrapped the earth in a conflagration of Divine Love. These decrees, therefore, are not hasty conclusions and arbitrary laws. They have been given only "after mature deliberations." There is the divine foreknowledge of God directing us through them. It is only at our peril that we can afford to ignore them. Let our children corne at the earliest age; give them the benefit of every doubt; let them continue daily, if possible; certainly let each day find great numbers at the Sacred Table. Several times a week they can go, and, thanks be to God! are doing so in many parishes. Hearing the confessions by divisions on the various days of the week; freely lessening the unnecessary confessions for those who are practically daily communicants, as is deemed prudent in each case; leaving the first hour of class free for successive divisions on the different days of the week; all these are means which have been tried with success. Let us write as an admonition over the door of our room the words of the decree: "Those who have charge of children must take the utmost care that after the First Communion the said children should approach the Holy Table very often and, if possible, even daily. "By the previous decree it was made a point of duty, "frequently and with great zeal" to exhort all the faithful, old and young, to this practice. There is no question of a counsel, but of a strictly binding obligation and a divine command. Thus to the rationalism and materialism about us we shall oppose the purely spiritual and invisible armor of the Eucharistic God. To the Socialistic destruction of authority and promotion of class-hatred we shall present the invincible charity of Christ, the Judge and Saviour of the world. To the vaunting pride and triumphant march of the hosts that are poured forth against us from the gates of hell we shall show, like the saints of old, the Sacred Host, displayed upon the walls of our citadel. Early and frequent Communion alone, with that devotion to Our Lady always so tenderly entwined with it, can assuredly save the Home and the Child. Children so nurtured upon the Bread of the strong and the Wine that bringeth forth virgins will never rise up against their priests and their bishops. They will never be numbered among the anti-clerical bigots of their age. They will never join in the Socialist hue and cry for the destruction of the Catholic school, which is the great bulwark of the Church in our times. He who moulds the character of the child makes the history of the future. There is no more powerful means given to the Catholic teacher or priest in the Catholic school for the formation of child-character than the Holy Eucharist. There is a picture we have seen which appeared in one of the most virulent Socialist sheets that was ever issued from any press. It showed the army of the children of the poor, with a background of scaffolding and belching furnaces against the distant sky. On, on, they marched, with bodies bent in the. speed of their irresistible advance poor, starved little bodies, in tatters and in rags, with unkempt hair and wistful eyes and shouting lips. On, on they marched, not knowing what it meant, here and there a worker in their midst, grim and resolute, while in the van there walked a mother, wan and haggard, gazing with despairing look upon the infant at her breast. Onward, onward was the rush of all, full of menace and revenge. And the legend read: "The future is the children's heritage." Are we less interested in Christ's own little ones? Between the age of six and eleven is the period which will probably determine the formation of their character. With such Eucharistic habits as we can then instill, with such a conformation to the life of Christ as Holy Communion can divinely effect in them, there is no danger that we shall educate a generation like to that which Jansenism has given to France and abstention from the sacraments has produced in Portugal. Great movements have already taken their inception in our own country. The march must begin with the children, as it has well been pictured. Shall its way be over our schools, our churches, our parishes; or shall we ourselves direct it for the glory of God in the cause of Christ and of His Church? We do not for one moment hesitate to say that the answer must largely depend, under divine Providence, upon the effect we gives to the decrees of the Church on Early and Frequent Communion. In conclusion we must appeal to the Catholic laity heartily to cooperate on all sides in the urgent work of firm, vigorous and truly Catholic organization. A spirit of Catholic solidarity is the need of the hour. The opportunities for undertaking and accomplishing original work in the social service are certainly not wanting; but there are likewise countless Catholic enterprises already organized which are languishing for want of the support they most richly deserve. Let the reader choose among these and give to the service of his choice his whole heart's devotion. It is no time to stand idle. The Lord of the vineyard is seeking through the world for laborers to enter His service. Though His call should come to us only at the eleventh hour, we must not fail to heed it. His service will amply repay us. There is, furthermore, the organized work of education, which calls for support in so many Catholic schools and colleges, where the true principles are instilled that alone can save society. And, finally, simplest and most important, there is offered to every one the apostolate of bringing into each home the Catholic papers or periodicals which can do the greatest good. "In vain," the Holy Father tells us in words which have perhaps become monotonously familiar, yet which, nevertheless, call for constant repetition until they shall at last be heeded, "in vain do we build churches, give missions and found schools, if we are not at the same time providing ourselves with that one weapon of defence, the Catholic Press." Here, therefore, is pointed out for us the one personal service to which we all, no one excepted, are called, and without which all other service will be entirely inadequate. The support and defence of every Catholic interest depends upon the Catholic Press. To the clergy, too, we may repeat the words which we have taken the liberty of addressing to them on a former occasion. Unlike Socialism, the Church is for all mankind; but the multitudes who must ever be her strength and her delight are the lowly and the poor of Christ. To these the Saviour's life was most tenderly devoted, and for these we too must sacrifice ourselves. If ever the Church in America would cease to be the Church of the poor; if ever her attention were mainly devoted to the rich; if ever the suspicion, so freely expressed, could be shown to be true that wealth more than immortal souls is the object of her thoughts, then her doom were justly sealed, and the bells from the steeples could only toll her passing knell. The forgetfulness of self, the labor unto weariness for the flock of Christ, the utter disdain for wealth except where it is spent in glorifying the House of God and erecting over all the land the temples of Catholic education these are our credentials before the world, they are the testimonies of our sincerity in the sight af the masses. They alone ring true and win for us the confidence of the laborer and the poor. They must feel that our house is ever open to them, our heart is ever warm for them, and our sympathies are at all times and on all occasions most eagerly enlisted in their cause. If, unlike the Socialist agitator, we are not blind to their failings or their faults, it is only because our interest in them is genuine, our love is sincere, our charity is Christ-like. In the face of the modern paganism, of which the excesses of wealth no less than the vices of Socialism are the shameless expression; in the presence of the idolatrous worship of worldly goods on the part of the poor as well as of the rich; in the struggle with the gospel of greed which would replace the gospel of Christ, and make of mere wealth and comfort the only object of existence, our own lives must shine out more than ever in Christ-like simplicity and divine contempt of all that is rilling the world about us with envy and hatred and revolt. Our duty is, evidently, to press ever more and more closely to the feet of Christ, whether we seek Him in the poverty of the crib or the nakedness of the cross. The more Socialism would brand us with the disgraceful stigma of "priests of Mammon," the more must we show ourselves in truth to be the followers of the Crucified. Here is clearly the first and indispensable condition for success. The laborer and the poor must feel that our house is open to them, our heart is warm for them, our sympathy is eagerly enlisted in their cause.